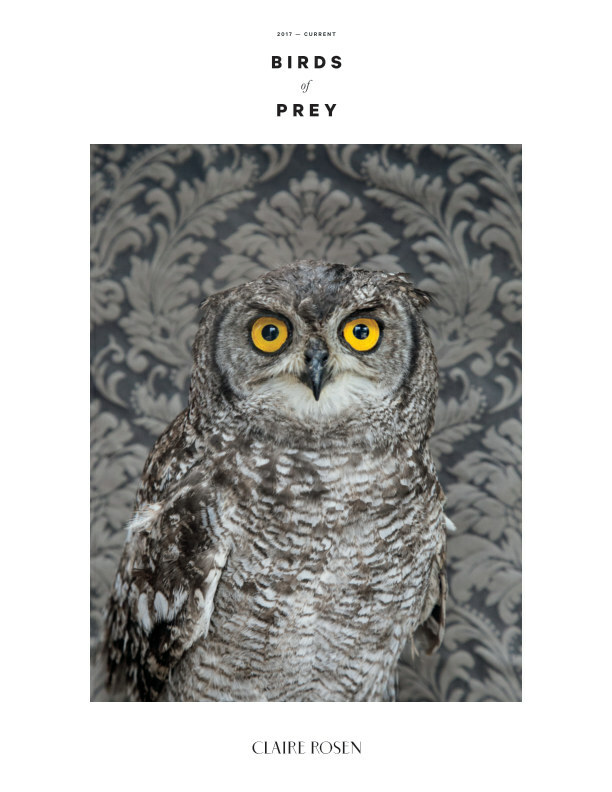 Gallery Catalogue of images from artist, Claire Rosen's series, Birds of Prey. Birds of a Feather began as a study of domesticated birds - from the common Parakeet to the exotic Hyacinth Macaw. Birds of Prey is an extension of that series exploring humankind's relationships to magnificent raptures. Falconry, originating in the far east, utilized these cunning birds as a hunting tools for catching food, first recorded in 1700 BC. Claire Rosen is an award-winning artist whose elaborate constructions often feature anthropomorphic animals, archetypal heroines, or symbolic still life evoking the aesthetics of classical painting. The transportive images captivate with a fascination of the natural world and ideals of beauty. Rosen was named twice to Forbes “30 under 30” for Art & Design and recognized by Communication Arts, International Photography Awards, Graphis, PDN, a five-time feature on the Photoville Fence, Photolucida, and Prix de la Photographie. Her work has been featured in Creative Quarterly Journal, Direct Art, Fast&Co, Feature Shoot, Juxtapoz, NPR, Refinery29, Slate and The WPO. IMAGINARIUM: The Process Behind the Pictures, published by Rocky Nook in 2016, covers the artistic and creative practice of photography. She graduated from the Savannah College of Art & Design in 2006 and Bard College at Simon’s Rock in 2003.